Lloyd’s Register Marine has created an easy-to-use app for smartphones and tablets, enabling its clients to access ship and fl eet data from anywhere in the world. This new app, using the func- tionality of LR’s award-winning web ser- vice Class Direct, has been specifi cally designed to give users access to the information they need whenever and wherever, and is available now for free on iPhone, iPad and Android devices. Kainadas, Marine Engineer for Greek ship managers Thenamaris. GL’s new Phast 3D Explosions software module enables ad- vanced 3D modeling, increasing both the accuracy and detail of the evaluations as well as information about the speed of vapor cloud explosion (VCE) analyses. Phast 3D Explosions can be used in a number of applica- tions, including occupied building analysis, facility siting, escalation assessment, plant layout optimization, determina- tion of design accidental loads on structures and equipment, defi nition of exclusion zones and in demonstrating regulatory compliance. Key features of Phast 3D Explosions software: • Detailed vapor cloud explosion (VCE) modeling. 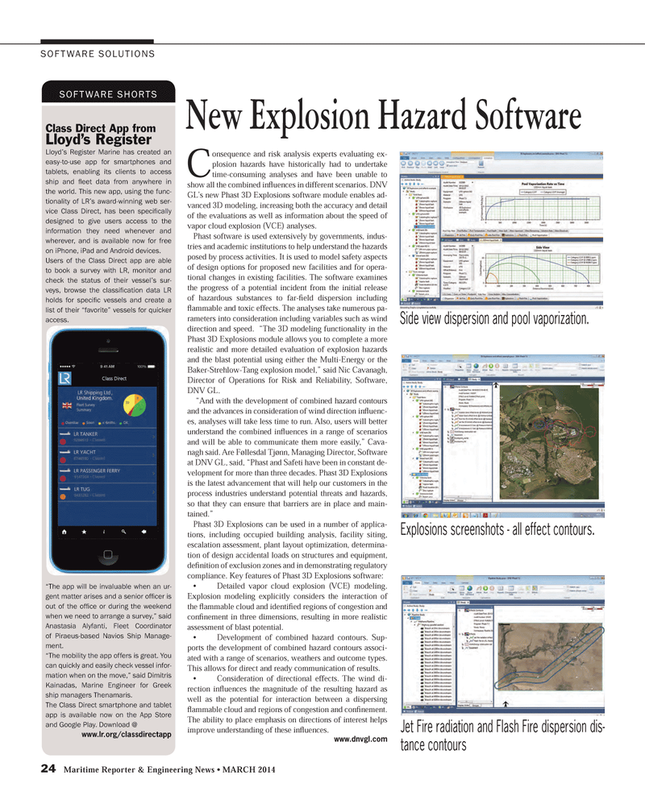 Explosion modeling explicitly considers the interaction of the fl ammable cloud and identifi ed regions of congestion and confi nement in three dimensions, resulting in more realistic assessment of blast potential. • Development of combined hazard contours. Sup- ports the development of combined hazard contours associ- ated with a range of scenarios, weathers and outcome types. This allows for direct and ready communication of results. • Consideration of directional effects. The wind di- rection infl uences the magnitude of the resulting hazard as well as the potential for interaction between a dispersing fl ammable cloud and regions of congestion and confi nement. Side view dispersion and pool vaporization. Explosions screenshots - all effect contours.